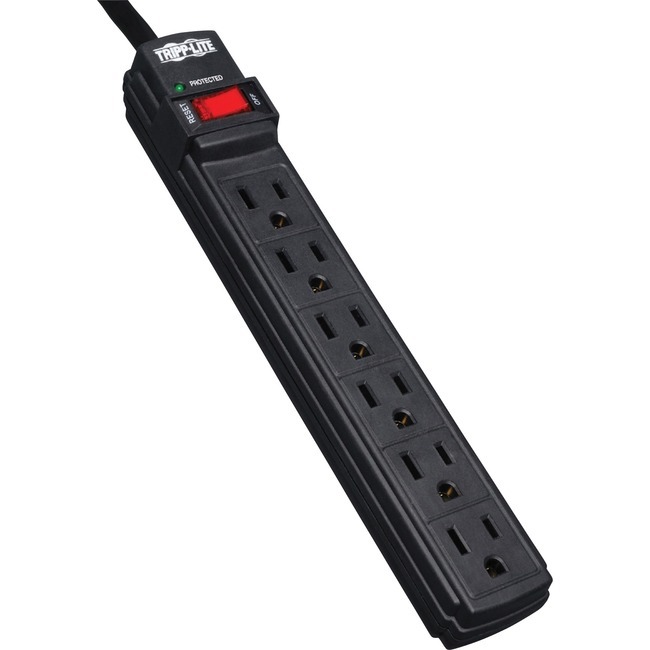 Surge protector with 6 outlets features a surge protection rating of 360 joules to defend your sensitive electronic components against unexpected surges and spikes. Versatile design protects all three wires used in residential power outlets with both a full normal mode (H-N) and common mode (N-G/H-G). It also filters out electromagnetic interference (EMI) and radio frequency interference (RFI) that can disrupt your electronics and inflict hardware damage or data loss. An integrated, 15A circuit breaker protects all outlets and shuts down connected equipment in case of an overload. The lighted on/off switch provides one-touch control over your connected equipment. A diagnostic LED lets you quickly see when your electronics are protected. The 6' AC power cord with NEMA 5-15P plug reaches nearby outlets to fit easily into your workstation or home theater setup. Keyhole slots incorporated into the bottom panel provide convenient wall or desk mounting options for easy access to power.